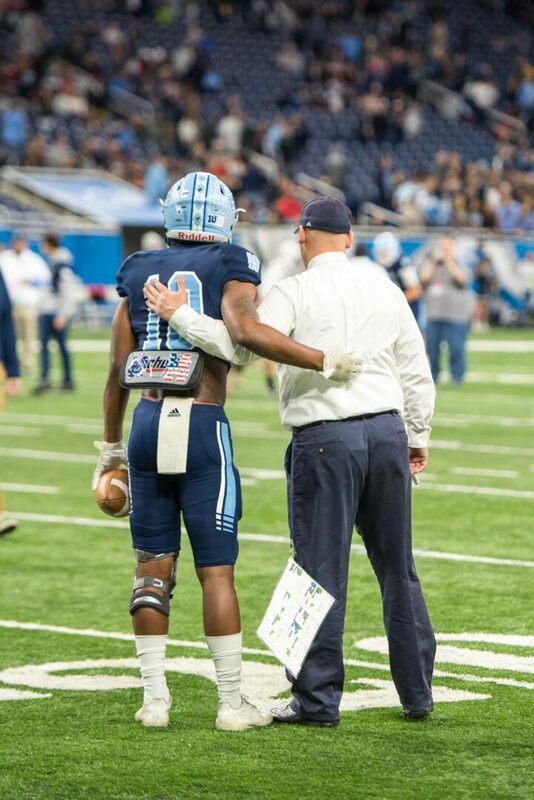 DETROIT — The quest for that first state football championship at Mona Shores High School will continue for at least another year. For the second time in the last five seasons, the Sailors fell just one win short of a state title. And for the second time, the defeat came at the hands of perennial state power Warren De La Salle. 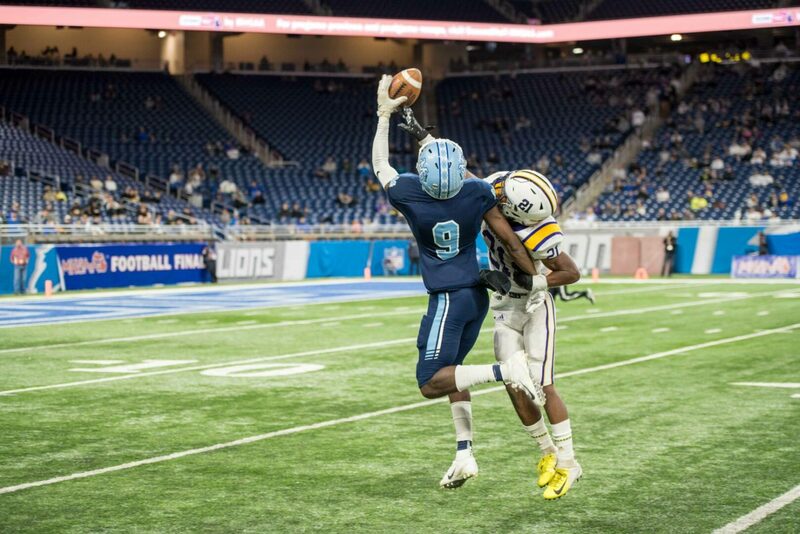 Mona Shores fell 29-16 to De La Salle on Friday afternoon in the Division 2 state finals at Ford Field in Detroit. The Sailors fought hard throughout the contest and kept things close, but in the end it wasn’t quite enough. 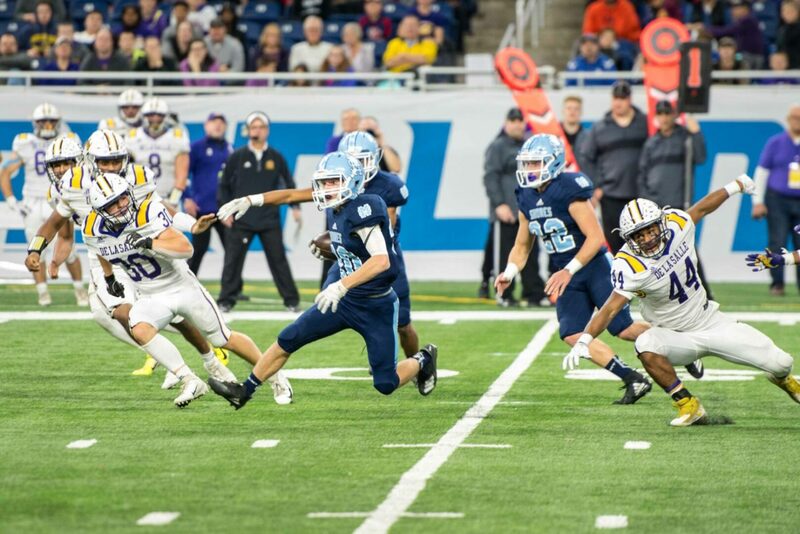 Mona Shores pulled within five points at 21-16 with 7:26 remaining in the game, but the Pilots drove down the field, took 5:31 off the clock, and iced the game with a one-yard touchdown run by quarterback Nolan Schultz with 1:57 to play. Mona Shores finished with a 12-2 season record and captured district and regional championships in the playoffs. The loss was extra hard on the group of Sailor seniors who battled so hard to attain their ultimate goal, but just came a little bit short. “I just want to say I love this team,” senior linebacker and Western Michigan University commit Jacob Wahlberg said after the game. “I love these seniors and I love team 56. I will be forever grateful for them. 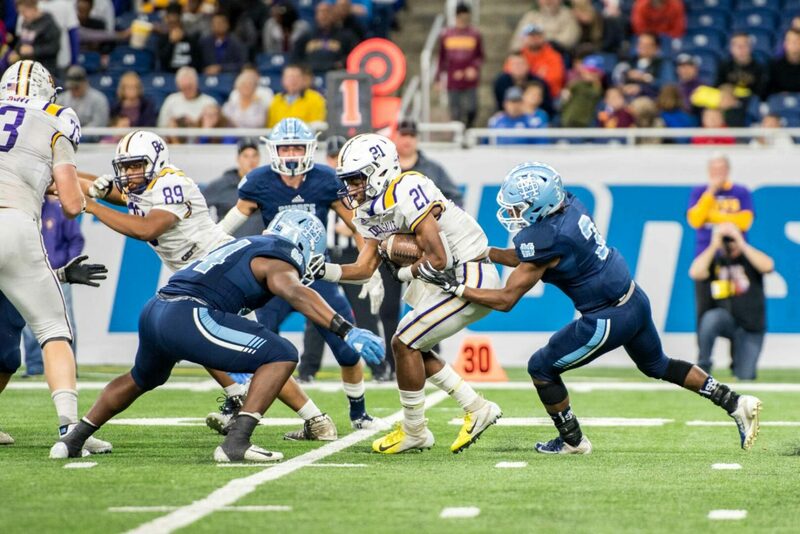 The Pilots defense bottled up the Sailor rushing attack early in the game, and Mona Shores failed to pick up a first down on its first four possessions. De La Salle also neutralized Broersma’s favorite target, receiver James Gilbert, for much of the game, holding him to two catches for 17 yards. The Sailors got the ball first, but were stuffed on fourth-and-one at their own 36-yard-line. Koziak said the game plan was to be aggressive coming in, so going for it on fourth down so early, in dangerous field position, was consistent with the strategy. Gilbert, who is also a defensive back, snagged an interception on De La Salle’s first drive, but the Sailors went four-and-out once again. The first points of the game came on the next drive, when Schultz scored on a one-yard sneak with 5:37 remaining in the first quarter, making the score 7-0 in favor of De La Salle. Mona Shores tied the game at 7-7 with 1:28 left in the first when Broersma punched in a two-yard run, and the score remained tied at halftime. 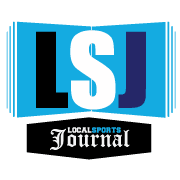 The second half scoring started with a 44-yard touchdown pass from Schultz to Jacob Dobbs early the third quarter, giving De La Salle a 14-7 lead. The Sailors cut into their deficit with a 24-yard field goal from Logan Hekkema, making the score 14-10 with 3:09 left in the third quarter. Schultz scored his second quarterback sneak touchdown with 10:44 left in the game, giving De La Salle a 21-10 lead. 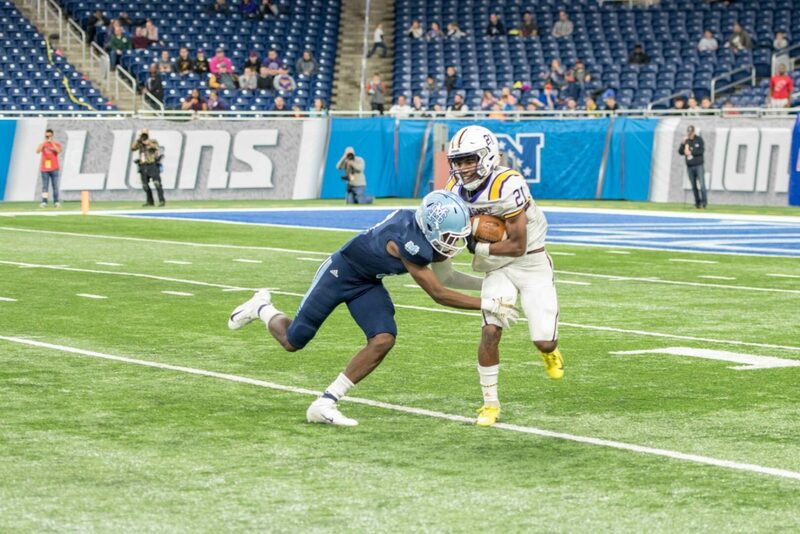 Mona Shores responded with a 14-yard touchdown pass from Broersma to Da’Varius Carter on a fourth down play, making the score 21-16 with 7:26 left. The final score came when Schultz once again found the end zone on a quarterback sneak. A two-point conversion pass to Michael McGinni was good, which made the score 29-16 in favor of De La Salle. The Sailors converted just one of nine third down attempts and were 1-for-3 on fourth down. The Pilots were 7-for-12 on third down, including 5-for-5 in the second half. Evan Vaillancourt led the Pilots with 59 yards rushing on 18 carries, while Schultz totaled 57 yards and three touchdowns on 10 carries. He also had 189 yards and a score through the air. 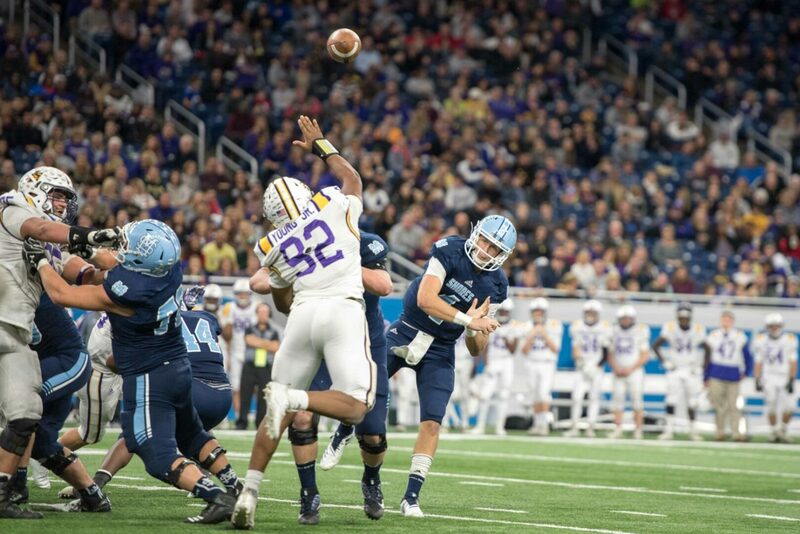 On defense, Dobbs led the Pilots with 16 tackles while Devin Campbell had 10. 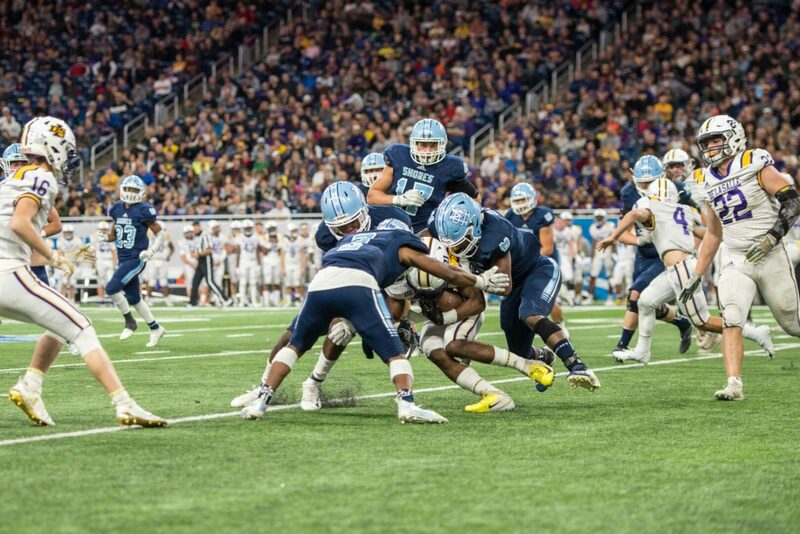 Sincere Dent led the rushing attack for Mona Shores with 88 yards on 12 carries while Broersma totaled 69 yards and one touchdown on 18 carries. Broersma also had 55 yards and one touchdown on 7-for-13 passing. Dent led the Sailor defense with 10 tackles, including a forced fumble, while Wahlberg totaled nine tackles and had a fumble recovery.